Throwing thousands of years of tradition to the wind, Keiko Fukuda chose to follow her own destiny and become the highest-ranking woman in judo’s history. Mrs. Judo: Be Strong, Be Gentle, Be Beautiful tells the inspirational story of Fukuda’s lifelong journey, spanning four continents, nine decades, and two distinct cultures, to overcome adversity and ultimately transform into a living legend. Fukuda was born in Tokyo in 1913, where two generations earlier her samurai grandfather was the first martial arts master to Jigoro Kano who went on to found judo in 1882. In 1934, Fukuda was invited by Kano to join his new women’s division, a progressive idea at a time when males dominated the sport. 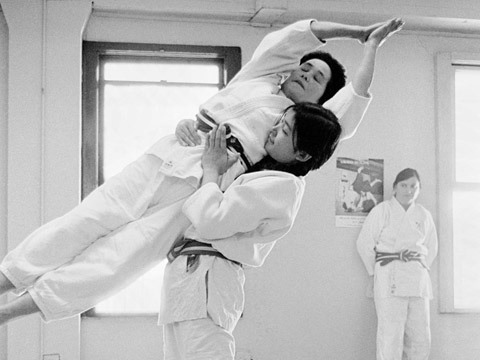 Judo’s black belt has ten degrees, but gender discrimination dictated that women hit a ceiling at fifth degree—until 1974. Facing her own struggle for independence as a young woman, Fukuda bucked tradition, choosing not to marry when she realized that as a wife she would have to give up her beloved judo. Her teacher, Master Kano, charged his students with the responsibility to spread judo around the world, and after Kano died in 1938, this became her life’s vocation. Today, at ninety-nine, Fukuda still teaches judo three times a week. After seventy-seven years of practicing judo, Fukuda now holds judo’s highest rank, tenth dan, and has earned the prestigious title “Shihan” (grand master). Fukuda Shihan is the last living disciple of Master Kano and the only living link to judo's origins. Yuriko Gamo Romer is an award-winning independent filmmaker. She commutes up and down her back stairs to the offices of Flying Carp Productions where she's working the distribution of her new film, Mrs. Judo: Be Strong, Be Gentle, Be Beautiful. She was born in Japan, grew up in the US, and is fluent in both languages and both cuisines. She has a master’s degree in documentary filmmaking from Stanford, a brown-belt from World Oyama Karate, and a lifelong passion for making things from real and found objects.